The first hatch I ever witnessed was on the West Branch of the Penobscot in May. Amazingly enough it wasn’t what I could see though, it was what I could hear! The sound of fish jumping out of the water. They were going crazy. It was a feeding frenzy! The sun hadn’t quiet come up yet so all I could do is listen. I remember asking what they were feeding on and being told blue wing olives. It wasn’t until the sun was up and I looked closely at the water that I could see these little may flies. I believe it’s that hatch that hooked me on fly fishing. As far as the eye could see there were salmon and trout going airborne trying to eat these little flies. Many years later while floating the same river with my son we witnessed something similar. It had started to rain and it was getting dark and like a flip of a switch fish started flying out of the water. There were BWO everywhere, this time I could actually see them. This is truly something to see and until you do, one could never really get it or appreciate it. We had many doubles and even had fish try to eat our fly as it was about to land on the water. 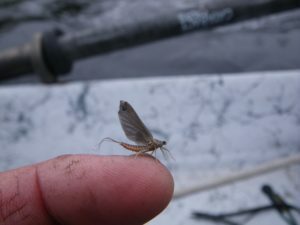 There is a lot of information out there on these mayflies so I don’t know it all but my goal with this is to keep it simple and give you info I do have, through first hand experiences or things I have read over the years. They are found here in Maine from May to September and range in size from 14 to 22. I often find them hatching on cool damp or rainy days. I’ve seen them right at dark and in the middle of the day. If I know I will be on the water on one of these days and nothing is rising I will fish a Barr’s BWO emerger off a big stone nymphing or as a dropper off a caddis or stimulator. Another fly I do well with is a cdc emerger tied as a dropper off another dry. This is what I do before I see flies on the water. Once I see a hatch, I have found a Adams matching the right size works great but have used many variations of a BWO dry. I would have several different ones on hand a long with nymphs and emerges be cause every body of water fishes different. 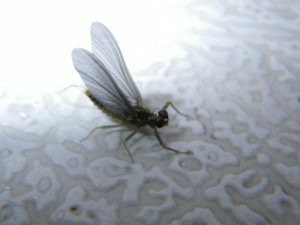 This entry was posted in Home and tagged blue wing olive, entomology, fly fishing, Maine, Maine Fishing by Kevin McKay. Bookmark the permalink.